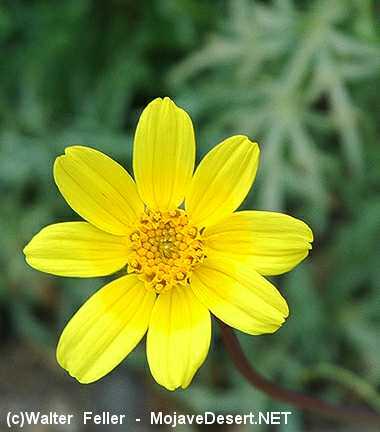 Ray flowers (apparent petals) have nearly square tips; grows 12" to 20" high. Found in desert gravelly slopes, creosote bush scrub, Joshua tree woodland, pinyon-juniper woodland. Stems chewed for the sweet juice. Whole plant eaten fresh or cooked and fried in grease and salt. Raw, bruised leaves eaten boiled or with salt. Leaves used extensively for food.